Exclusive Puma A.T.P. Heel gives firm support without exerting pressure on the Achilles tendon. Leather cut-out is padded. Gives protection where injury is most likely to occur. Soft Collar – luxurious comfort for your ankles without any sacrifice in support. Orthopaedic Design – each shoe is built to the anatomical form of the foot. Ensures a fit like a second skin. Flexible Nylon Sole. Tremendously tough. Agreeably light. Featured on all Puma Screw – in shoes. Moulded soles in top – quality lastic are just as tough, just as light. The distinctive Puma Form Strip gives your feet firm lateral support. Screw – in studs are interchangeable. You can tailor your own shoes to suit any ground conditions, The Puma range includes both Screw – in studs and Moulded soles. See the lot in the catalogue. Send us your name and address together with 1/ – in fourpenny stamps and we’ll send you a copy, Puma. 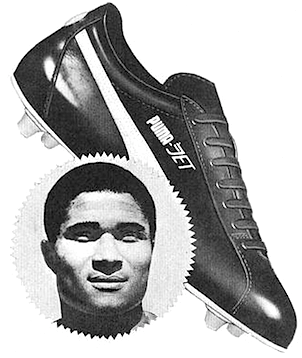 A great shoe worn by a great footballer. Alfred Reader & Co. Ltd., Teston, Nr. Maidstone. Kent. ALFRED READER & CO. LTD.